New Hazard from Large Hadron Collider??? Some physicists have posited a possible new hazard at the Large Hadron Collider at the CERN lab in Switzerland which may result from Bose Einstein Condensates, a super cold matter by-product of the LHC. The circuit of the particle accelerator is encased in a sea of superfluid helium (a known Bose Einstein Condensate) and strong magnetic fields a combination which can cause a huge explosion known as a Bose Einstein Supernova. But our friends at CERN say nothing to worry about. Apparently the LHC is also harnessing the power of 100,000 computers through the use of the internet grid. Update: 01/23/09 Collider could create black holes that could last up to one minute. I have been involved in a few interesting web-based activities in the meditational/psychic area of late that are open to all. First is the Peace Intention Experiment promoted and planned by Lynn McTaggart of Living In The Field. Every day this week just past noon, participants focus on the same target. The intention is to lower violence in the targeted area by having thousands of individuals meditate on peace there. The target is the Wanni region of Sri Lanka that has been wracked with violence for years (1983) due to a civil war. Currently the experiment is still in progress and I hope to be able to report that there have been positive results when the effects have been tabulated. I have also been listening to some fascinating podcasts, most outstandingly The Paracast. While I don’t agree with everything the hosts, Gene Steinberg and David Biedny, say, they certainly are on the same page with me! Their presentations are interesting and extremely informative interviews with individuals at the forefront of paranormal investigations like Nick Pope, Philip Imbrogno, Dr. Steven Greer, Jan W. Vandersande and many, many others. Steinberg and Biedny are not “true believers” and they are not debunkers, they are critical thinkers with well thought out questions for their guests. I highly recommend their podcast if you have an interest in anomalies and thirst for some stimulating discussion on the subject. Many, but not all of the programs deal with the UFO phenomena. I have also signed up with the Arlington Institute to participate in a premonitions project they are beginning. Honestly I have not been able to figure out the website as to how it works. Hopefully it will become clearer. Maybe there will be more on this later too. Gamma Ray Burst Aimed at Earth! OK science fans, this is way weird. It seems that on March 19, 2008 a huge gamma ray burst from 7.5 billion light years away was aimed almost directly at Earth. It would have been visible with the naked eye if one were on Earth in a dark space facing the source of the burst. New Scientist says it was “a particularly focused jet”. This brings up some metaphysical thoughts for me. The first of which relates to the time space continuum. It seems that the idea that time cannot exist without space and space cannot exist without time has been fairly well demonstrated by cosmology. I accept this intellectually. I work at owning this as a concept in my daily life and try to integrate it into my construct of the nature of existence. Totally integrating this idea into one’s being would, I think, radically change one’s sense of self in the world, especially when added to other physics concepts such as the idea that matter is not at all solid, but mostly empty space. In fact I once (in 2000) had a very transcendent experience regarding the nature of time in relation to the time space continuum. The second thought that comes up may be thought by many to be rather fanciful. That is: was the gamma ray burst aimed almost directly at Earth totally by accident? I don’t claim to know the answer to that, but it is food for thought. The first thing that strikes one when entering the Peters Valley area is the incredible natural beauty of the setting. This place is a true bucolic gem set on the site of the tiny deserted village of Bevans and former farmland in New Jersey’s Sussex County. There are bear and deer and all manner of small furry local creatures wandering about, including a group of small-eared rabbits that seem to be a natural mutation, because there are also regular rabbits living along side them. I roomed in a rehabilitated 19th century farmhouse on the grounds that had many stories to tell. 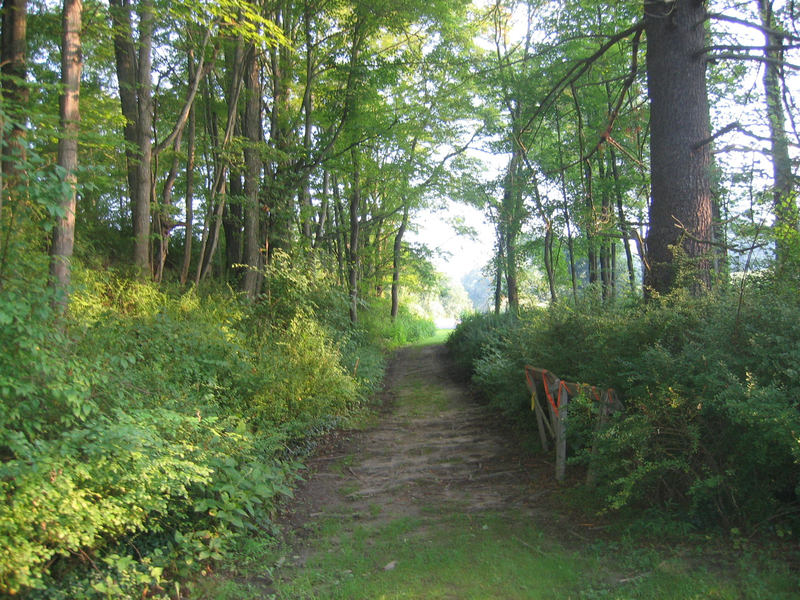 Peters Valley is a craft education center that was started in 1970. 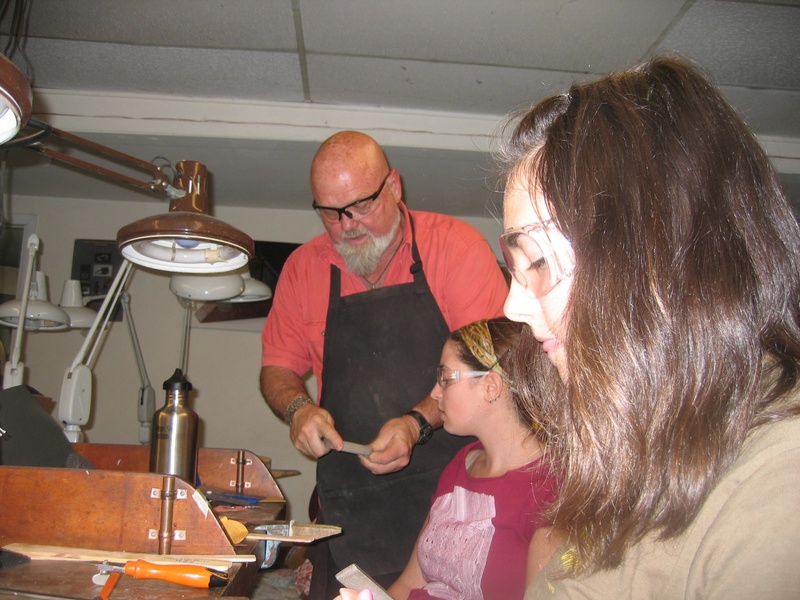 There are numerous courses from which to choose in the areas of fine metalworking, fiber arts, blacksmithing, ceramics, photography, woodworking and two dimensional design. I chose to enroll in Basic Jewelry with Frederick Marshall. I have enjoyed beading for more than twenty years and more recently have become involved with energy balancing jewelry employing semiprecious crystals, shell, polished stones and wood. I also worked briefly on Manhattan’s 47th Street for a wonderful jeweler who makes the most beautiful gold antique reproductions. 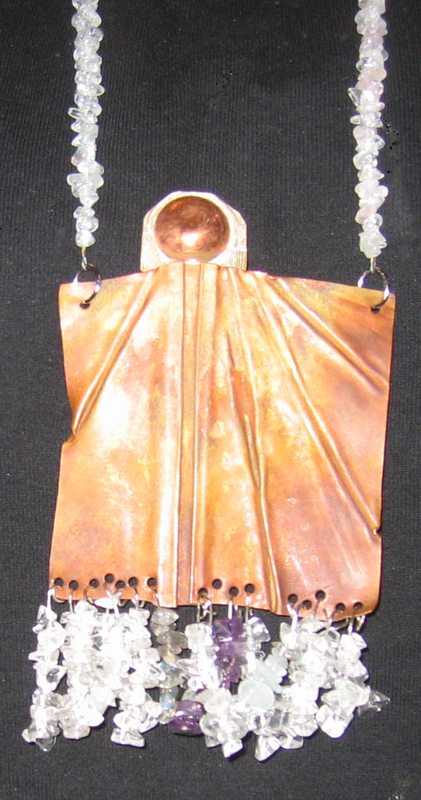 This class focused on copper and silver jewelry with touches of bronze and brass. 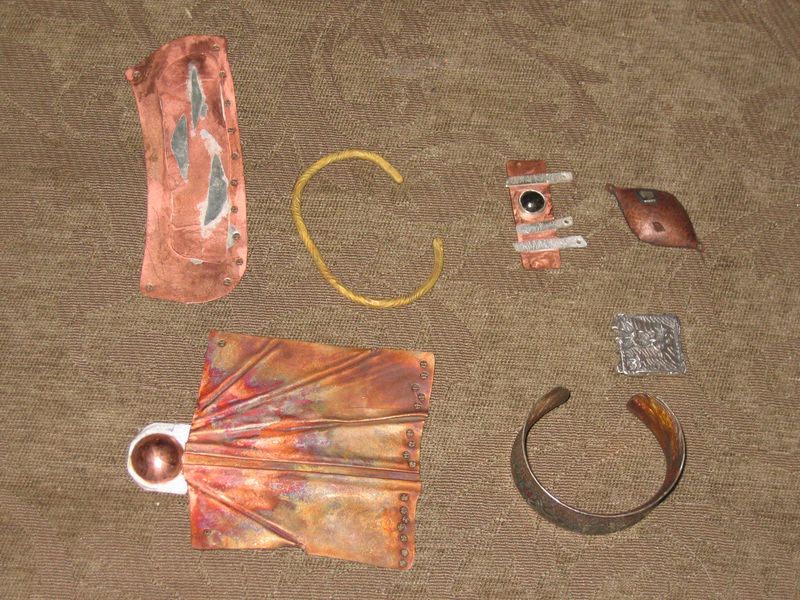 These are considered the non-ferrous metals (not iron or steel). Rick Marshall, our able instructor, assisted by genial Kristin, imparted huge quantities of practical and artistic information to our group of 10 students. He is knowledgeable, humorous and earthy, an all-around regular guy and an easy person with whom to converse. He has a serious job to do because silver and coppersmithing requires the use of very high temperatures, acetylene torches, and potentially dangerous equipment. There is so much to know and digest, I could easily see someone taking this course more than once. Indeed there were two repeaters in the class. The workshop was well appointed with workbenches and tools for everyone to use, along with lots of equipment. That brings me to the only potential downside of this course. If you want to continue doing this at home you must set up an acetylene torch and purchase a significant amount of tools, and possibly, machines such as a flex-shaft. One fascinating technique we learned was cuttlebone casting. You hand-carve the bone of a cuttlefish to make a one of a kind silver or copper casting. Many people will recognize cuttlebone as the white object fastened to birdcages with which the birds sharpen their beaks! In short, we soldered, rolled, filed, tempered and drilled metal for more than eight hours a day and we loved it. I also had the opportunity to see the blacksmithing class in progress under the tutelege of Jim Wyckoff, and that was very impressive. I came home with seven items, some of which are unfinished. I am in the process of adding crystal beads and chains, so check back at this post later to see a finished product. Here is the silver cuttle bone casting I did, worked into a necklace of labradorite and hematite. This is a large pendant I made from a practice piece of copper into which I had put some interesting folds. I added a silver and copper “head” and later a mostly quartz (several other crystals mixed in) fringe at the bottom and a long necklace of quartz crystal. It is a rough primitive looking piece.